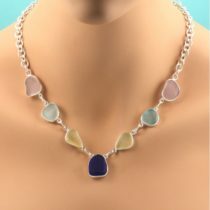 Purple sea glass jewelry is one of the more romantic types of sea glass jewelry because of the history and unique character of the lavender, amethyst sea glass hue. Learn more. 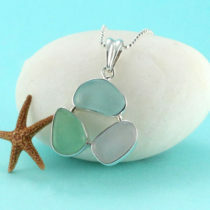 Our genuine purple sea glass jewelry is special because each design is hand-crafted, making it truly one of a kind. All of our lavender-hued sea glass jewelry is made with real purple sea glass that is beach found and never altered in shape or size. 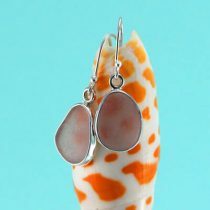 We invite you to shop our purple sea glass collection. 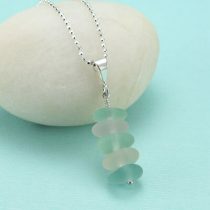 We offer purple sea glass necklaces & pendants, purple sea glass earrings and purple sea glass bracelets. Each purple sea glass gem is different, the only one of its kind, and it comes with a 100% satisfaction guarantee and free shipping. Why Is Purple Sea Glass Purple? Most softly colored purple sea glass found today actually started as clear glass. It has turned purple, or more accurately, a light shade of lavender or amethyst, because of manganese and sunlight. When exposed, over time, to the UV rays of the sun, manganese, an element used as a decolorant during the glass making process, causes what was clear glass to take on a lavender or amethyst tint. The more manganese, the deeper the purple tint becomes. The more exposure to the sun, the darker the hue can become. We often leave our lavender sea glass outside or on a window sill to let the sun darken its color. Purple glass actually dates back to around 2,500 BC, but its peak production periods, and the source of most purple sea glass found on beaches today, typically occurred during the late 1800s to the early 1900s. During this time, purple glass was used in household dishes, cups, bottles, food containers, door knobs, car windshields, and even some depression glass patterns. The actual “creation” of purple glass was discovered accidentally when too much manganese was added to batches of glass intended to be clear in color. Common glass is typically made of silica sand, soda ash and limestone – sometimes referred to as the “soda-lime glass mixture.” Without adding a clarifying agent, this type of common glass would have a light green-blue tint due to iron impurities found in the sand. Many elements have been used to decolorize glass but from the late 19th Century to the 1920s, a compound known as manganese dioxide was widely used. At the time it was known that when manganese was used in high concentrations it would give glass a deep purple color. But what was discovered during the turn of the century, was that small amounts of manganese would provide just enough purple tint to counteract the green hue from the iron, resulting in clear glass. After World War I, other compounds gained popularity, replacing manganese as a clarifying agent. 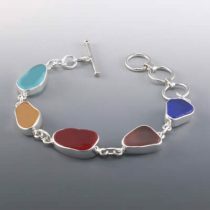 How Rare Or Valuable Is Purple Sea Glass Jewelry? The glass that ultimately becomes sun colored, purple sea glass was produced during a relatively short time frame (1880s til @1915) so it is considered rare. 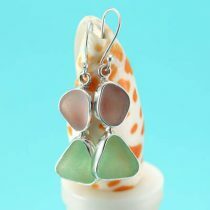 It is estimated that only one out of every 500 pieces of sea glass collected is this beautiful, soft lavender color. Ask any veteran sea glass hunter how difficult it is to find lavender, amethyst sea glass on a sunny day and they will tell you how easy it is to mistake this pale color for white, and maybe not even pick it up. When you wear a genuine piece of our lavender, amethyst or purple sea glass jewelry, know that the beautiful purple sea glass you’re wearing is not only very old but nature has had more involvement in its creation beyond the usual conditioning and frosting associated with sea glass. As a bonus, your jewelry may even become a slightly darker and richer purple depending on the amount of manganese it contains! 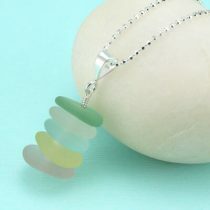 Where Do We Find The Purple Sea Glass For Our Jewelry? Most of the lavender and purple sea glass we discover for our jewelry is from beaches in the North Atlantic, specifically the United Kingdom, Bermuda and Nova Scotia. We also collect quite a bit of lavender sea glass in Northern California at a former ocean dump site that was closed in 1943.
Who Should Wear Our Purple Sea Glass Jewelry? If you love the color, purple, these beautiful purple sea glass gems will speak to you. 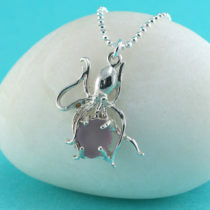 Also purple sea glass jewelry is a unique alternative to the purple, amethyst gemstone, the birthstone for the month of February. The amethyst color has a rich history and is thought to have some mystical attributes that date back to the early Greek civilization. You can read more about those intriguing mysteries here: Amethyst | Lavender Sea Glass Jewelry Collection. Because purple sea glass is rare and in limited supply, purple sea glass jewelry makes a thoughtful and unique gift with personality and a history to go with it! We invite you to peruse our assortment of purple sea glass necklaces, purple sea glass earrings, and sea glass bracelets with purple sea glass.